I’m skipping today’s parade downtown. I’m not much for parades, not even on the 4th of July, or the spectacles like Macy’s Thanksgiving Day Parade or the Rose Bowl Parade. I am a devotee of Martin Luther King, however. Like Rick Sanders in Soda Springs, King changed my life. 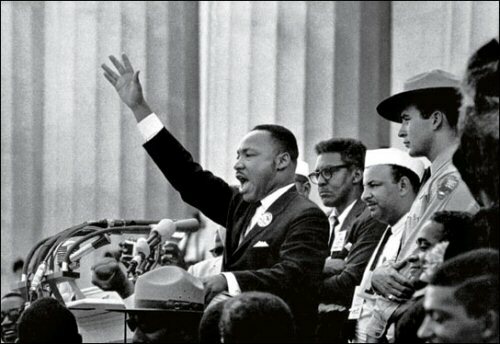 He inspired both Ricky and me with the bus boycott in Montgomery, with the Children’s Crusade in Birmingham, with “I Have a Dream” at the March on Washington. We devoured his books. We marveled at his oratory. We celebrated his Nobel Peace Prize. We applauded his opposition to the Vietnam war. We cried when he was murdered. I’m honoring Martin Luther King today by re-reading two of his most famous pieces, “Letter from Birmingham Jail” and “I Have a Dream,” both of which I’ve reprinted in their entirety on my website. Click on them below.